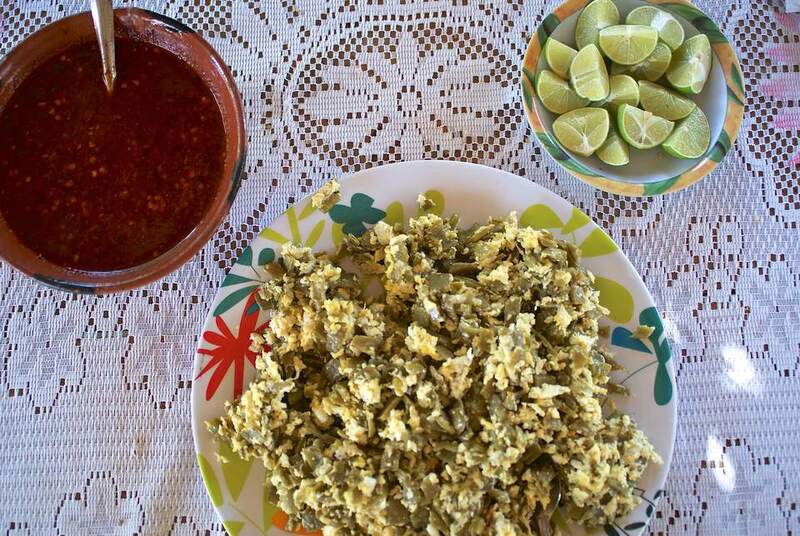 Nopales (cactus leaves) with scrambled eggs are a delicious and super easy to make treat. The soft, almost grassy flavor of the cactus (it is a plant, after all) goes as well with eggs as similarly mild-flavored but distinctive veggies like asparagus or spinach. Add salsa or hot sauce as you like, you may like this dish with a spicy salsa fresca or a drizzle of chile citrus sauce for real zing. They are also best served with warm corn tortillas, although you may enjoy them with some hot buttered toast, too. Use a sharp knife to cut off the spikes from the cactus leaves, if necessary (be very careful as you do this). Rinse the nopales and pat them dry. Cut the clean, trimmed nopales into 1/4-inch-thick strips. Cut off and discard the stem end of the shallot. Cut it in half, letting the in-tact stem end hold each half together. Remove and discard the papery peel. Make horizontal cuts into the shallot, then cuts running from the stem end, then finely chop it into a dice, using that stem end to hold it. Discard the stem end when you're done. In a large frying pan over medium-high heat, melt the butter or heat the oil. Add the diced shallot and nopales and salt. Stir to coat with the butter. Sprinkle with half of the salt (1/4 teaspoon). Reduce heat to medium, you want the nopales to be sizzling, but not browning. Cook, stirring frequently, until the nopales are tender and most of their liquid had evaporated, 15 to 20 minutes. Crack open the eggs into a medium bowl. Whisk to beat the whites and yolks together thoroughly. Sprinkle in the salt and whisk to combine. Serve immediately, with sauces and accompaniments as described above or all on their own with salt and pepper to taste, naturally. Be extremely careful and use a sharp knife to cut off and remove the spikes on the nopales, or buy nopales with their spikes already removed.